Camberwell’s MA Summer Show starts this week so we have a number of posts giving us an in-depth look into our graduating students work. MA Fine Art Digital student Terence Quinn, aged 70, took over our blog explaining his work The Refugees’ Crisis, which portrays his way of showing empathy to those who went through the experience in 2013. My name is Terence Quinn, but most people call me Terry. I am now in the last few weeks of a two-year MA at UAL Camberwell College of Arts and my final MA Show is about to begin. Very exciting for a member of the grey haired brigade! Before starting the MA art was my hobby, alongside a long and varied career in business technology. I could design and draw from life but I was not a practicing artist. I thought that the MA Fine Art Digital course at Camberwell would suit me perfectly. It has enabled me to attend a proper art school, as well as to research and extend my art making using digital technology. I saw it as a perfect combination, and so it has proved beyond my wildest expectations. I have been so enthused that I have worked as though it were a full time job, which being formerly retired I admit was a fortunate position to be in. In that way I aimed to add as many artistic skills to my toolbox as I could so that I could finally call myself a practising artist. My technology background means I have no fear of becoming an early adopter, but I can see how long it takes to learn some art related technology. I resolved to try out leading (sometimes ‘bleeding’) edge digital technology as long as I could master it in a month or less. I became fascinated by 3D graphics, 3D scanning, 3D printing, 3D and conventional digital filming, binaural sound, IoT (Internet of Things) and Virtual and Augmented Reality. I have used all of these facilities and techniques, but have had to scour all six UAL colleges for technical resources, and acquire some (expensive) equipment myself. 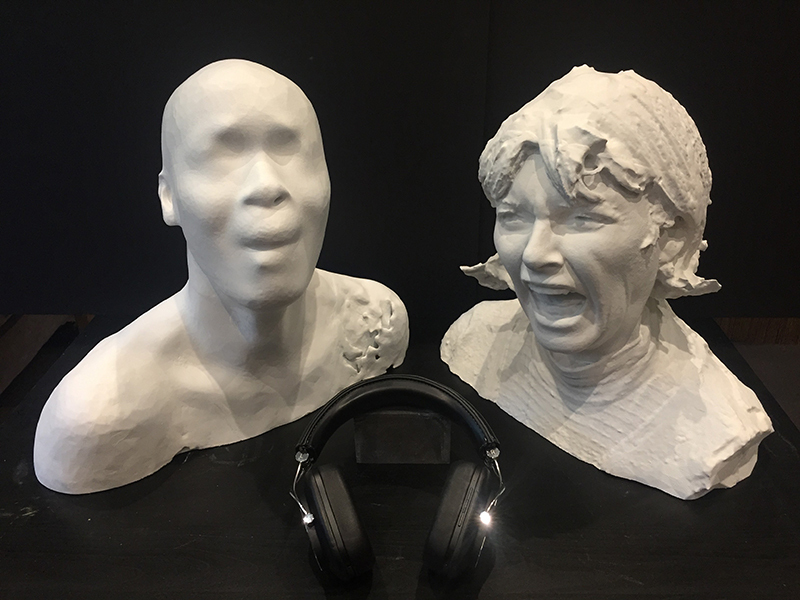 Along the way I have made bronze and plaster sculptures which can talk when approached, as well as huge holograms which can be seen, using a headset, as an integral part of a real world physical art installation. These technologies and techniques have become an integral part of my art practice which is essentially storytelling about people and their life experiences, but in as an immersive way as possible. Most of these elements are incorporated in my final MA degree show piece The Refugees’ Crisis. To give you a bit of background of my final show: I was enraged when the UK refused to accept a quota from the EU to relocate refugees seeking safe haven. I was further enraged when the UK accepted only a few of the unaccompanied children and then stopped altogether. I felt that we were not doing anywhere near enough. So I decided to make my MA show about this. I felt that the refugee crisis was being viewed by UK and European citizens as primarily a problem and crisis for themselves, not for the refugees. I believe that there should be more empathy towards the refugees considering the harrowing lives they were trying to escape from. Nobody risks the death of their family members, at sea in the case of my final piece, unless they are facing real danger or extreme deprivation and intimidation in their home country. So I aimed at increasing that empathy in my art installation. Terence “pointing as producer, director and autocue operator” on set with the film crew and scriptwriter. In my research I came across the then recently published Waterstones book of the month The Optician of Lampedusa by the BBC European correspondent Emma Jane Kirby, who had earlier made a BBC radio broadcast about this true life event. I made contact with her and she and the publishers Penguin gave me permission to use this as the inspiration for my artwork. Penguin also donated the paperback copies of Emma Jane’s book. I donated the hardback copies, though 45 books are available during the show in exchange for a charitable donation to causes supporting refugees. Information about Terence’s can be accessed via this QR code, also available on a bookmark in the books available at Terence’s show. Also a donation can be made to the Oxfam Refugee Crisis Charity fund. I went about making my final piece with two professional actors who were scanned and then 3D printed at life size scale. The same actors were filmed in a green screen studio in one of Camberwell’s technical resources, with two versions of the short film and a binaural recording produced. 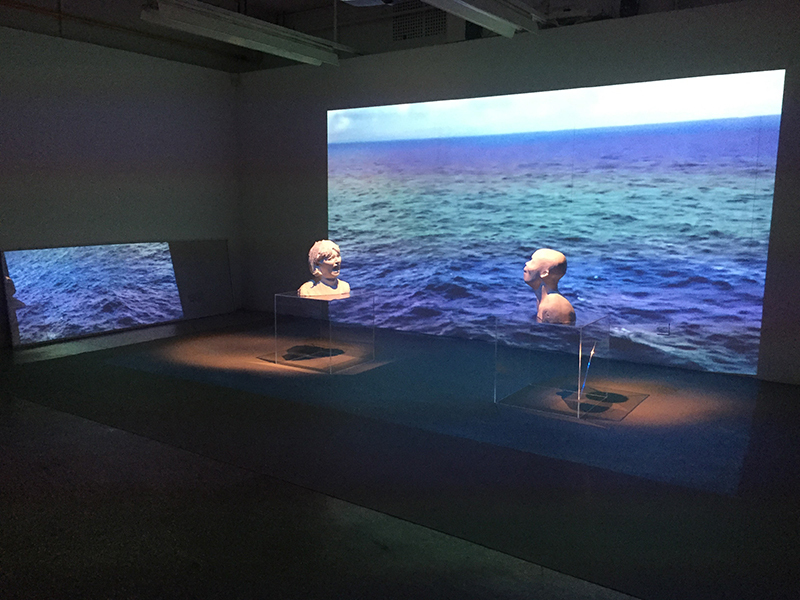 I used transparent plinths against projections of the sea on the floor and wall to create the impression to the viewer that the refugee was in the water. The 3D scan of the refugee was enlarged to huge scale several times and inputted into the Microsoft HoloLens Mixed Reality headset, alongside a version of the film with the actors seen against a transparent background. 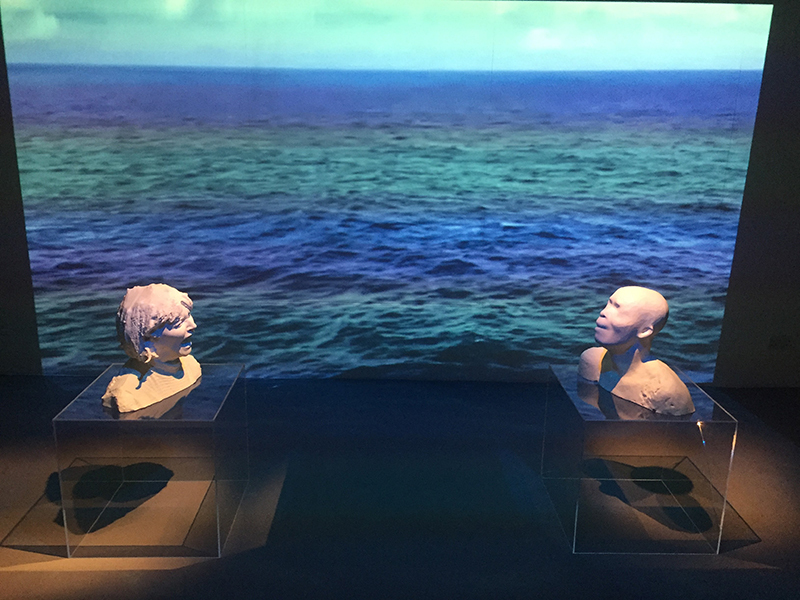 This approach allows the viewer to see the physical exhibit as well as the actors and holograms on the headset – they appear to be in the same physical space. The intended outcomes are: firstly to allow visitors to experience the physical exhibit standalone; secondly to put on headphones and listen to the powerful binaural recording as though they were there when it was originally recorded; thirdly to experience the same binaural recording with the actors in view on the physical set while also walking around the over sized holograms of refugees in the sea. When thinking about my future plans it is hard to have further career goals after retiring, but I would not have completed an MA in something entirely new to me if I intended to slow down. I hesitate to apply for a job, as I have spent many years freelancing, but there are one or two I could be interested in, but at my age probably will not get. I have applied for a part time position at Tate as an Assistant Curator (no lack of ambition there then!). I am also seeking a supervisor for a practice based PhD where digital and art combines, which is not so easy compared with more traditional art forms. So it seems that I may have a gap year or so from these ambitions, aiming to take an art studio alongside others with similar interests and to apply for residences. One of my highlights was definitely making a bronze sculpture from a 3D scan and 3D print. Becky who is in charge of the foundry is simply amazing, and very patient…she had to be for me! Finally just to say Jonathan Kearney is a fantastic course leader, who will bend over backwards to help you succeed. Listen carefully to his comments! You can see Terence’s final piece The Refugees’ Crisis along with the other graduating MA Visual Arts students work at 1 Wilson Road 13-19 July.